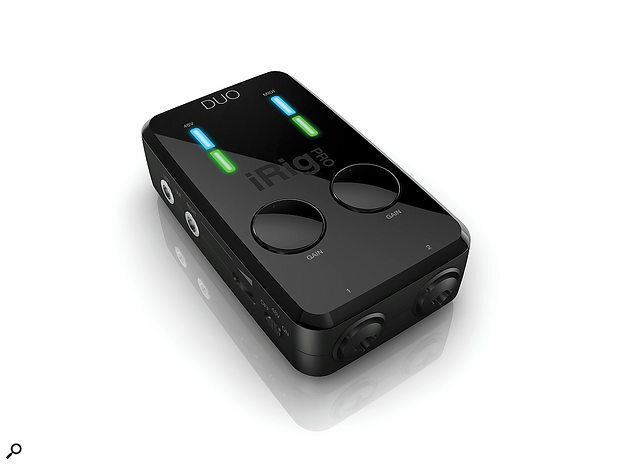 The iRig Pro Duo promises to be a versatile and affordable all-in-one studio for iOS, Android and desktop computers. This all-in-one studio records 24-bit audio and comprises two XLR/TRS combo preamps with phantom power, balanced line outputs (in addition to the headphone outs), direct monitoring and MIDI in/out. All the important interconnection cables are supplied in the box, including a Lightning cable for iOS, Micro USB for Android, standard USB and MIDI connection cables. The interface runs on either AA batteries or an optional DC power supply for mobile use, and draws power from a USB port on a Mac or PC. Despite being illustrated with a mic-stand bracket in press photos, there isn’t one included. Again, IK offer an optional accessory that would be suitable for this job. Getting started with a mobile device or Mac OS is incredibly simple, since no software or drivers are required. Windows drivers are simply downloaded from the IK web site following registration. A range of plug-in and app software is bundled with the Duo, although functionality of these offerings varies quite dramatically. By way of example, the entry-level version of the AmpliTube amp simulator software is enough to get you going, but when switching through the presets you frequently run into functions you cannot access without paying for an upgrade. To compound this issue, IK’s installation bundle installs files for absolutely all of their plug-ins on your computer — whether you own them or not — in the full range of proprietary formats. This takes up significant space, and I found myself having to go through the relevant folders and manually remove the plug-ins I didn’t need. Such a ‘freemium’ model is quite annoying and confusing. At the other end of the spectrum however is T-RackS Classic, a handy mastering system with RMS/average level meters, a real-time analyser and handy multi-band limiter and master equaliser. These plug-ins are really fit for purpose, adding tangible value to the overall package. In session, preamp and playback quality is perfectly respectable, and the interface is simple to operate. Fit and finish is largely solid too, with smooth gain controls that aren’t easily knocked out of position once set, handy LED activity/clip metering, and sufficient weight to the case to avoid it moving around on the desktop once everything is plugged in. Latency levels are pretty usable too, yielding good results when feeding a guitar input through an amp simulator in GarageBand on iOS, or whilst triggering a virtual instrument via the MIDI input. When recording audio I found the direct monitoring to be incredibly useful in avoiding latency altogether, but the slider switch lacked the reassuring ‘click’ of similar controls on the case. Also, in some circumstances, the audio stream goes to sleep within 20 seconds or so of playback ending — presumably designed to save power when using batteries. This happens when playing back system audio on a mobile device and, more annoyingly, on a desktop computer whilst power is being supplied by the USB port. Since waking the audio stream can take two to three seconds, clicks and buzzes occur during this time, forcing you to return to the start of tracks playing back to monitor them without the nasty noises. This issue falls short of IK’s ‘Pro’ moniker in my opinion and hopefully this might be addressed by a firmware update down the line. Thankfully, there’s no such problem once DAW and audio applications are open and in focus in both mobile and desktop contexts; the audio stream stays awake once it’s up and running. 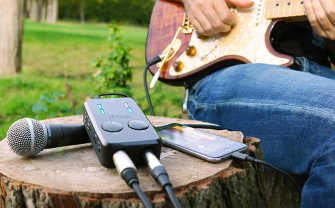 During testing, a brand-new set of batteries lasted around 90 minutes, with phantom power being drawn from one of the mic inputs for only part of this time. Prospective users would do best to invest in lots of rechargeable batteries for mobile use, and/or stick to using dynamic microphones — not unreasonable demands given the mobile capabilities of the interface. Despite some niggles, the iRig Pro Duo really packs punch as a truly mobile device, at a significantly lower price than its closest rival, the iOS-only Apogee One (reviewed in SOS March 2015). Whilst it doesn’t have the same high-quality preamp and converters as the Apogee, you get more audio ins and outs, MIDI I/O and Windows compatibility. Meanwhile, a few of the bonus software offerings help to seal the deal and will surely find a use in the home studio. Alongside the unveiling of the 9.7-inch iPad Pro at Apple’s March Event, the company also released — some might say finally — a Lightning to USB 3 Camera Adaptor that features an extra Lightning connector to provide power to your iPad. This means that when you’re using the iPad with accessories that aren’t able to deliver power, such as certain MIDI and audio interfaces (like RME’s Babyface Pro that I reviewed in the May issue), you’ll now be able to use that accessory for more than the length of a single charge. It might not be elegant, but it’s certainly better than the alternative! The new Lightning to USB 3 Camera Adaptor is available for £29$39 and is compatible with all Lightning-based iPads. If you’re using the adaptor with the 12.9-inch iPad Pro, you’ll get USB 3 transfer speeds; however, with the 9.7-inch iPad Pro (and presumably all other Lightning-era iPads) only USB 2 is supported.